In the aftermath of Reconstruction and the ratification of the 13th, 14th, and 15 th Amendments, southern segregationists increasingly turned to their state legislatures to enact discriminatory legislation known as Jim Crow laws. 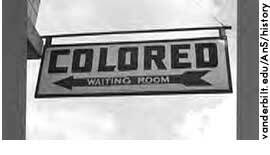 In the South, segregation became the law of the land, a status quo that was upheld in 1896 when the U.S. Supreme Court ruled that "separate but equal" facilities for blacks and whites were constitutional. White southern legislatures added insult to injury by passing other laws that made it difficult for blacks to vote, effectively disenfranchising a significant number of black citizens. By 1945, most southern states had been so successful in their application of Jim Crow regulations that the vast majority of American blacks failed to move beyond the second-class status of their ancestors in the early 1880s. Nonetheless, Jim Crow was not unassailable nor could it hope to survive the vast social, cultural, and economic changes that the Second World War had induced. In a landmark decision in 1954, Brown v. The Board of Education of Topeka, the Supreme Court overturned Plessy v. Ferguson and ordered the integration of southern institutions with "all deliberate speed," a directive that met with virulent hostility from many white southerners who occasionally turned to violence as a means of resisting the desegregation process. In 1957, President Eisenhower federalized the Arkansas National Guard and forced the integration of a high school in Little Rock. In 1963, President Kennedy compelled the segregationist governor of Alabama, George Wallace, to integrate the state's university system, a move that signaled the beginning of the end of the Jim Crow era. Over the next five years, the Civil Rights Act of 1964, the Voting Rights Act of 1965, and the Fair Housing Act of 1968 officially ended the ability of any state to discriminate, disenfranchise, or otherwise restrict any individual on the basis of race. Norton, Mary Beth, et al. A People and a Nation: A History of the United States. 6th ed. New York: Houghton Mifflin Company, 2001, 856-858.